For the last few months, one each week, CNN has been unveiling its 2013 CNN Heroes--"everyday people changing the world." Thousands of submissions were sent in from around the globe, and 24 people have been chosen as heroes (a few more are left to be revealed). 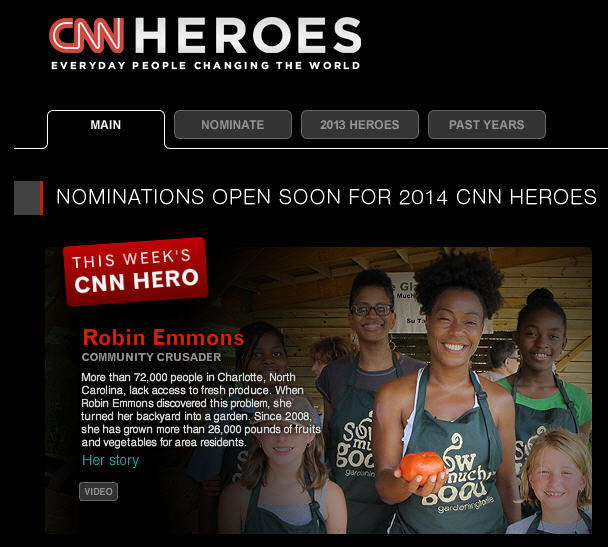 This week's CNN Hero is Robin Emmons, founder and executive director of Sow Much Good, a nonprofit organization that's working to eliminate urban food deserts in Charlotte by providing access to fresh fruits and vegetables, and educating people about healthy lifestyles, among other things. I've seen and read about Robin's work for the last couple of years, and she and her team have done a great job of spreading their message and reaching the people who most need their help. But as the CNN article on Robin points out, more than 72,000 people in Charlotte lack access to fresh produce. So she has a lot of ground to cover, just in this city alone. And they're doing it. The video below shows a few examples of how Sow Much Good, now with 200 volunteers, has grown more than 26,000 pounds of fresh produce for local underserved communities. It's one thing to not eat healthy because that's your choice, but it's another to eat unhealthy foods because you can't afford or don't have access to better food. That's often the case for people in low-income neighborhoods, who end up eating most of their meals from dollar menus at fast food restaurants, and do much of their grocery shopping at gas station convenience stores. On Thursday, October 10, CNN will reveal the Top 10 CNN Heroes of the year, with each receiving $50,000. As you've likely seen in years past, the top 10 will be featured on the CNN Heroes: An All-Star Tribute telecast this fall, and the person selected as CNN Hero of the Year will receive an additional $250,000 to continue his/her work. During the tribute show, the heroes are each introduced by celebrities. Let's hope that Robin Emmons is selected as one of the top 10. But even being chosen as one of the 24 heroes is already an incredible accomplishment. Get all the details by visiting CNNHeroes.com. Sow Much Good, sowmuchgood.org, facebook.com/SowMuchGood, twitter.com/SowMuchGood.